Episode Review: GLEE, "Dream On"
The epic Joss Whedon-directed Glee episode guest starring Neil Patrick Harris has come and gone, and while it didn't disappoint, it really didn't blow me away either. The underwhelming parts of the episode had nothing to do with NPH because his storyline was spot on...it was some of the other sub-plots that had me shrugging my shoulders. 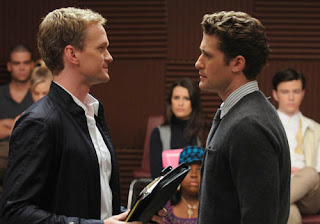 NPH was great as former glee star Bryan Ryan, and he was able to make us hate him, sympathize with him, and dislike him all over again in a matter of minutes. Bryan was a complex character because while he was the bad guy, it was easy to understand where he was coming from. Show choir didn't take him where he felt he was destined to go, and he was bitter. I'm sure there are a lot of people out there that could relate to his story. Once Will convinced him to give his dream another shot, I couldn't help but get excited for him. Of course everything had to go south after the "Dream On" duet, but we all knew the day would be saved by Shue, and when he explanation of why he did what he did was touching. I've said if before, and I'll keep saying it...NPH can do no wrong. It would've been easy to make Bryan Ryan a one-note character (like Molly Shannon's Brenda Castle), but Harris and Whedon were able to round him out. It doesn't hurt that NPH is a natural performer, and his acting and singing was a natural fit on Glee. I know this is never going to happen, but I'd like to see NPH become a series regular once How I Met Your Mother is done (which would be next season if I had my way). Even if that isn't going to happen, I do hope Harris comes back for a few more guest spots. The Artie-Tina subplot was OK, but it was just more of the same. 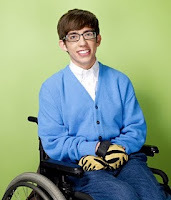 We know Artie's in a wheelchair, and we kind of understand how he feels about it, but always shining a spotlight on his disability is getting old. Sure, Artie's been able to showcase his singing chops (and his dance moves tonight), which makes him a more dimensional character, but his wheelchair is usually the subject whenever he gets an episode dedicated to him. I respect Glee for showing students from all walks of life (like last week), but now we need to move past the chair and see Artie in a different kind of story. The boy can dance though. For me, the weakest storyline from tonight's episode was the Rachel-Jesse-Shelby baby mama drama. When Jesse slipped the tape into Rachel's baby stuff, I got excited because it drove home the idea that Jesse's just there to sabotage New Directions. Then, we got the swerve that he's there to help Rachel realize that Shelby is her birth mother. Almost everyone automatically pictured Idina Menzel as Rachel's mom due to the fact that Lea Michele looks so much like her, but actually casting her in the role seems easy which is why it's kind of a letdown. I was expecting for a more creative way to use her character. This is going to sound cold, but part of me hopes Shelby is still playing everyone and she's not Rachel's mom. That'd cause some drama. Tonight's music was pretty awesome, and I love it when the show really makes the theme of the episode work through strong music choices. Bryan and Will's rendition of "Piano Man" was great, and their "Dream On" duel wasn't as overproduced as it came off in the preview. Artie's version of "Dream a Little Dream of Me" while Tina and Mike Chang danced was also very moving, especially when Quinn places her hand on Artie's shoulder. Other Odds and Ends: The Glee version of a Glee flash mob was a little distracting at first, and a little too meta, but it all worked in the end. I didn't realize how much I'd miss Brittany because it was constantly waiting for one of her one-liners, which never came. Sadness, but I was glad that we got to see her during the "Safety Dance" sequence. I swear my eyes automatically go to Heather Morris whenever she's on screen. "Dream On" was still very entertaining despite its minor flaws, and it did give us a story arc for the remainder of the season. The second part of Season 1 has seemed a little disjointed because there really hasn't been a common thread connecting the episodes. Yes, they're getting ready for Regionals, but we really don't see them practicing as much as they used to. Now, we have the Rachel's Mom storyarc to go along with the Finn-Kurt Family one to take us through the rest of the season which will do for now, but I can't wait for a tighter second season that has a very directed narrative from start to finish.